No Rest for the Weekend! Grabe. Tinatablan pa pala ako ng lagnat. Last Monday I knew I was not in my tiptop shape to work: my body's aching, my arm muscles were throbbing in stress, and I got this clogged nose that was lobbying for my head to pain me more. 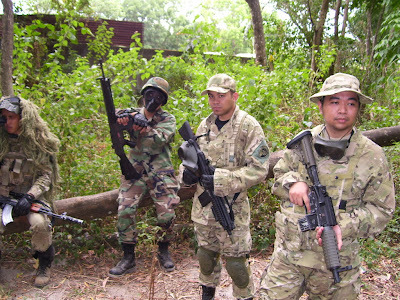 Normally, this would have been the case after a frantic day spent playing airsoft so I was quite used to endure these stuffs regularly. Kaso, it was on that afternoon that I felt lightheaded and knew a flu was going to hit me soon. Balak ko pa naman gumala that night since wala namang pasok the other day. Actually, I played with the thought of STILL going to Greenhills despite the condition. Eto naman yung type ng lagnat na carry ko pa din na hindi ihiga e. Kaso, nanaig ang tawag ng pahinga. Awk! I just went straight home that night with an aching head and an aching heart. Wushus! Pumunta ako ng Greenhills. I and Kim should be checking this Spindepence event by Planet Zips. They're this local group of people who do "poi". This "poi" thing really intrigued me lots simula nung napanood ko siya sa TV some years ago. Eto yung mga nagpapaikot-ikot ng colorful strings to do patterns and all, and most of the time they do it with flames on its ends. Astig yung mga yun. Very fascinating just staring at em do their thing. If only I could find even some ounces of spare moments to commit another hobby into my already jampacked time. Four of their girls were featured on Maxim (either the February or March issue... I forgot) and one of them's Amanda Lapus. I so find this girl really cute ever since her Modess(?) commercial days waaay back several years already. Eto yung commercial - themed "Set your spirit free" - where tinamaan siya ng bola sa isang arcade center by this barkada of dudes. She picked it up and tossed the ball back to the ring with a basket, and smirked back at the guys. I was only able to remember her name because my sister has a Candy magazine with her on the cover. That's her and the other Zip girls on one of their gigs. 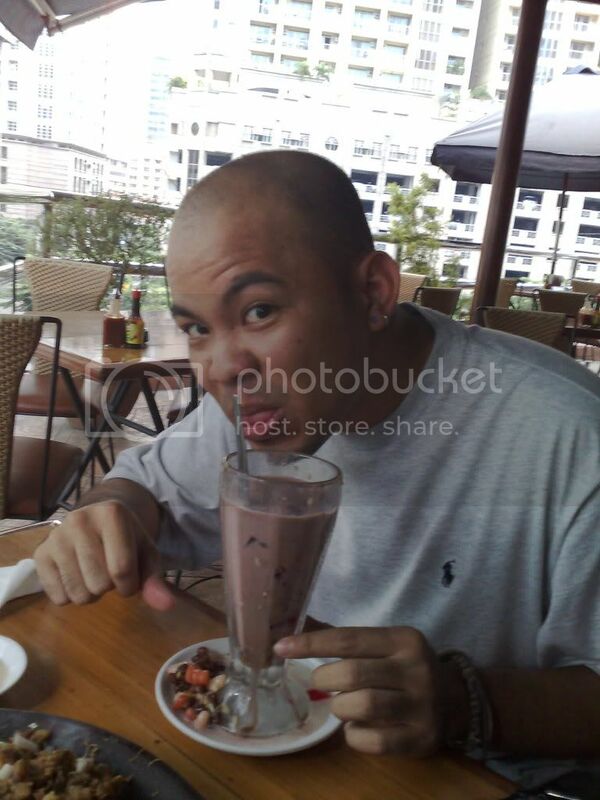 Ayun balik sa istorya, Kim was the one who did the website for Planet Zips and he personally knows Cat. I gave him my issue of that Maxim so maybe he could have it signed kahit from kay Cat lang. Tas yun, sabi niya pag nagka-event na lang sila ulit we could personally meet them for the autograph tas pakilala niya daw ako. Gusto ko lang naman ng photo ops sana. That would be cool. Kaso mo nga umulan ng malakas last Friday and I guess the event was postponed or something. Sa open area kasi siya ng Promenade yata supposed to be held and the place was deserted when I got there. Si Kim naman naipit sa trabaho. Argh, foiled! Uh well. There's always a next time. Tumambay na lang ako sa Fortress sa Virramall. As usual, andun si Crispy tsaka si Little John. Some friends passed by too in trickles. Dumating din si Geloman. Nung nagsara na sila ng shop, we headed to Arv's crib and cooked pasta for the Shak dahil birthday ni Garrboy last 25th. Birthday nga din pala ng sister ko last 26th. After everything was cooked, we rushed to the Shak to be welcomed by the ravenous denizens! I spent the morning playing with the twins, reading this "Dune" book, and painting miniatures. 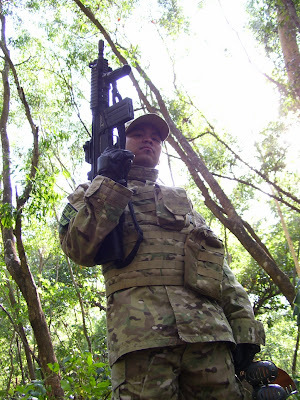 By afternoon, I packed my stuffs for the airsoft invite in Pampanga scheduled on the following day. 6am ang kitaan sa Shak and for sure hindi ako magigising ng ganun kaaga kung sa bahay ako manggagaling so I decided that I'll spend the night at the Shak instead. Nag sidetrip muna ulit ako sa Virramall. I saw Sultan on the way. He came from Fortress too. Pag dating ko dun, the store was jampacked with friends. Ano ba talaga yun, tindahan o tambayan?!? Hehe. Tambayang malupit until around 9pm then we closed the shop then happened to pass by on an amateur boxing event along our way to the car. It was in the open space by the Promenade. Astig. Parang mga basagulerong pinag-suot lang ng gloves. As in, you could outright see that they're not playing the scientific way of boxing. They're literally "brawling" kaya mas nakakatawa panoorin. We just heckled our hearts out regardless of some passers by staring at us. May mga female boxers pa and in my opinion, their matches seemed better to watch than their male counterparts'. Deretso kami sa Shak. Jampacked as usual. Kain. Chillax. Tas hinatid na namin si Fluffy sa Pasig then headed to Marikina at JC's crib. Madaling araw na ito so let's jump to the next day. Inabutan namin yung koya(?) ni JC playing an online game. We planned on hanging out in their crib until 5am before picking up Ricky in Masinag. Anything under the... moon(?) talks! Sa tulong ng bubblegum kung supermint at kapeng barako, we were able to last the whole morning up and sparky. Dinampot na namin si Ricky afterwards, then headed back to the Shak. 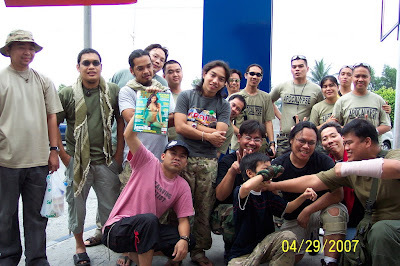 The boys trickled in to prepare for the journey up north to Angeles, Pampanga for the airsoft invitation handed out by Team Semper Fi. Syempre, kasama na naman namin ang aming sister team - Apocalypse! Natulog lang ako during our push to Shell-NLEX where we met up with Team Apocalypse. Photo ops and goofs off gallore ensued! Partida, most of us haven't got any decent sleep at all. Mga adik! Grubs at Burger King then a dude from Team Apocalypse showed us his latest issue of FHM. Huddle up boys! Basically, minolestiya ng bayan yung kopya niya. After everything, we went back on the track towards Angeles City. Natulog ako buong trip. It was somewhere in Barangay Cutcut and the game site was actually more cool than I imagined. It was a four hectare field of customized bunker field. Thus, its name - Bunker Wars. Out team - Screaming BB's - were notorious for our powerful guns but Semper Fidelis has their own weapons to boast - gas powered BB poppers! Aray! Tunog pa lang parang ayaw na namin sumugod. Haha. Worm's Eye View. Kita utak oh! Still, the whole day went (as expected) fun! Natulog ako after my second game para lang mag recharge but the rest of the afternoon was crazy cool. Before sunset, we charged the NLEX traffic back home - that's after a much-needed dinner at Petron-NLEX. Drop point is, of course, at the Shak before the denizens dispersed to their respective cribs. Oo, napilitan na ako gumawa ng Multiply account. Napupuno na kasi itong PC ko ng ritrato. Mahirap na. Baka biglang masira harddisk, sayang mga iningatan kong pics. Visit or add me at that account. Back to work. As mentioned, nilagnat ako nun. Siguro dahil sa init sa Pampanga tas biglang super lamig naman dito sa opisina. Heard a couple of remarks about the immortal "kulang lang yan sa kiss-pirin at yakap-sul". Don't know why no matter how vague that line is, it's still being delivered and to top that, there are still people who gets entertained with it! Behehe. As usual, I don't take medicines with common flu. Sankatutak lang na juice at tubig to flush out toxins. Umuwi lang ako that night, despite compulsions to still hangout elsewhere. Tinext ko sila Batgurl and Idol prior to that day kung free sila manood ng Spiderman 3 premier night. Turns out they're not. Medyo good thing since iL sure be off the mood with this flu around. The bad side is I still won't have to see Iday. Olats. Missing her like crazy. Spent the whole morning painting my miniatures, playing with the twins, and basically, waiting for the flu to pass. By around 4pm, I packed up and hit the road to Greenhills. Usual suspects in the house! Chillax lang while the guys pit themselves for some miniature gaming actions. Kwak Doktor Arvin Kinkytops suggested that I drink Gatorade tis he said is good against flu. The boyz agreed. Gatorade it is! I, then, went for a walk with the Great Maw - Jake Pookiemonster - while he hunted for some CD blanks which resulted to a sidetrip to V-mall's foodcourt. Grub time. Meryenda lang daw sabi ni Jake but we had rice and pork! Aray. Verily, none shall satiate the eternal hunger of our Gyudon Warrior. After we closed the shop, the denizens packed towards Mien Sann somewhere in San Juan to chow down on some mainland chinese deli. After that, off to Shak we go! Joe was there, passing time doodling on his sketchpad as usual. The groom-to-be Emp dropped by with another copy of his wedding invitation. Gelo appeared from thin air after getting his car AC fixed. Alas, may kasabay na ko pauwi! Doc Marco was there too and Bikerdude Caloy. The Shak was getting more boisterous and da Shakboyz wilder as the night went deeper! The natives are restless so to speak so we need to take the noise away. Buti, Geloman invited us to his friend's bistro in V. Luna Extension for a couple of Saint Mike's barley. Ocho Bar nga ba pangalan nun? Basta, it's not bad. The food's good, but I could be biased. Sakin kasi basta masarap ang sisig patok na sakin yung lugar! Hahaha. Maraming kumakain. Mostly yuppies and students from nearby schools (malapit na siya around Ateneo, Maryknoll, at UP). Shot lang konti tas we headed back to the Shak na din. Tas chillax lang konti sabay dispersal! hope ur feeling much better. schoolmate ko nung HS si amanda lapus, 1 batch higerh siya sakin. yup she's very pretty, tapos matalino pa kasi she was part of the HOMO class (class ng mga matatalino). L: wow. but HOMO class just doesn't sound right. hahaha. thanks thanks man.